For over 30 years, the national leaders in Interventional Cardiology and AMF have provided independent peer review of cardiologists and cardiac catheterization laboratories, performing many thousands of high quality reviews for academic medical centers and community hospitals. We help labs achieve the highest level of patient safety through improvement in quality and appropriateness (AUC Guidelines). AMF is experienced and has served as the Institutional Review Organization (IRO) for hospitals that have been the subject of a Corporate Integrity Agreement (CIA) which have focused on Interventional cardiology and by mandate, under the same CIA, other specialty department and quality peer review issues. We are experienced in providing the required on-site cath lab expertise and service line oversight by nationally recognized leaders in the field. We have responded to hospital attorney requests for cases involving quality of care, overutilization and medical necessity, in many areas including interventional cardiology, pacemakers, spinal surgery, sleep medicine, physical medicine and rehabilitation, otolaryngology, radiology, pathology and others. AMF Executive Director, Evelyn Baram-Clothier, delivered a Keynote Address to the Federation of State Medical Boards 100th Anniversary Meeting on April 28, 2012. She presented the Bryant Galusha Lecture on the benefits of Telementoring on Post Graduate Physician Education, Patient Outcomes and Patient Safety. Peer Review Protection Under Federal Law. 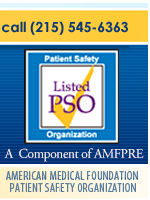 We are unique in forming partnerships with other PSO organizations to provide peer review support for their member hospitals. A non-profit agency for physician education. Since 1987, AMF has been the leader in physician peer review often followed by onsite surgical mentoring for skills improvement using the nation’s most preeminent educators. In 2001, our division FAME awarded a two million dollar grant to six surgical specialty societies to determine the optimal process to safely learn new procedures. The results published in 2005 showed that our three-step template (didactic learning, simulation training, and on-site mentoring) was highly effective in improving skills for practicing clinicians. Continuous on-site mentoring proved to be logistically challenging as travel was the major limiting step. AMF then created an opportunity for two specialty societies to test whether the process could be greatly improved by utilizing “remote presence”, telementoring. The newly published results below from our Grant were quite positive. World Premier Edition of Telementoring in Surgery.